A low-level campaign to democratise the UN Security Council has been sputtering along for almost as long as anyone can remember. But it intensified in 2005 when then Secretary-General Kofi Annan formally threw his weight behind the reform agenda and launched formal negotiations. In the same year, the African Union (AU) adopted the Ezulwini Consensus, including a common African position on Security Council reform that demanded at least two permanent seats and five non-permanent seats – to be allocated by the AU itself. Significantly, the AU also demanded complete equality of its proposed permanent seats with the existing five permanent seats (the P5), meaning that either none should have the veto; or all should. First Nigeria and then South Africa threw their hats into the ring in 2005, informally declaring their candidacies for the African permanent seats if these were ever to materialise. There was a flurry of diplomatic activity after Annan’s 2005 initiative in New York, but after some time it petered out because of firm resistance. The inflexibility of the AU was cited as one of the obstacles to change. The so-called G4 coalition (Germany, Japan, India and Brazil) had mounted the strongest campaign for more permanent seats. The G4 was smart enough to realise that securing permanent seats would be hard enough without also demanding veto rights. So, they agreed to temporarily shelve the veto question for tactical reasons. The AU, though, stuck to its ‘maximalist’ demand, as some have called it, rejecting any suggestion of ‘second-class’ seats, with no vetoes, for Africans. That wrecked any chance of forming a potent and credible coalition with the G4, though of course there were many other pitfalls – not least the resistance of some of the current five permanent members (the P5) and the United for Consensus coalition (UfC, aka The Coffee Club) of smaller rivals to the G4, who were determined to prevent their big neighbours from acquiring even more power by getting permanent seats on the Security Council. In February 2009, the General Assembly kick-started the flagging reform effort by launching the Intergovernmental Negotiations (IGN). Their most significant achievement seemed to be a proposal from the UK and France for interim solutions; creating new seats that would be for longer terms than the current two years of non-permanent seats and that could become effectively permanent, perhaps by being immediately renewable. Currently, a country must vacate non-permanent seats for at least two years after each occupation. 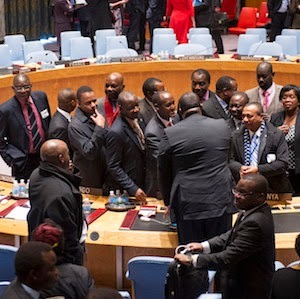 However, the IGN negotiations were also bogged down – until the current President of the General Assembly, John Ashe of Antigua and Barbuda, revived them in October last year by appointing Zahir Tanin of Afghanistan as new IGN chair and an Advisory Group of six UN ambassadors. In December, this Advisory Group produced a so-called Non-Paper, accompanied by all sorts of reassurances that it was ‘neither a negotiation text nor a replacement of any existing document…’ Such effusive caveats concerning the inconsequentiality of a document are often, ironically, a sign that it is a serious attempt at compromise – and this one could be the most serious so far. It is superficially innocuous, since it tries to include all the main positions. Yet – and this is borne out by the reaction of various coalitions – the tendency of the Non-Paper is towards more seats of greater permanence. The tendency of the proposals on the veto for new members also seems to be towards compromises, such as suspending the veto for 15 years. Conversely, the existing vetoes of the current P5 could be limited, such as never using them to block Security Council action aimed at preventing or ending genocide, crimes against humanity or war crimes. This was at least the assessment of Ernest Bai Koroma, President of Sierra Leone, who is also chairperson of Africa’s Committee of Ten, (C-10) which has been tasked by the AU to pursue UN reform. He reported to last week’s AU summit on the progress of the negotiations. The C-10 itself is against the Non-Paper, judging by Koroma’s report. Even so, the Non-Paper has caused a stir in the AU, according to South African officials, and this has contributed towards a decision at the summit last week to hold a retreat of foreign ministers to review the Ezulwini Consensus. President Jacob Zuma advocated such a retreat. He argued at the summit that Africa could not simply continue reiterating its fixed position as it had done for nine years and needed to compromise. South Africa itself has always been ready to compromise on Africa’s demands, for the sake of progress. It has been ready to suspend the demand for veto rights, if that could weaken P5 resistance to change and even to accept interim proposals for longer-term, renewable new seats. South Africa and some other real contenders for permanent seats have suspected from the start that the maximalist Ezulwini Consensus was largely driven by Africa’s own clandestine ‘Coffee Club’ of spoiler nations that don’t have a chance of getting a seat themselves, but don’t want anyone else to get one either. Pretoria feels such spoilers also dominate the C-10 and it agrees with other reformists, such as the G4, that Africa has subsequently been a major stumbling block to negotiations to expand the Security Council. Some – or maybe all – of the G4 reformists wish that South Africa would abandon Ezulwini and join them in what would be a potent coalition campaigning for permanent seats without immediate vetoes. But South Africa says that would risk the loss of many of the vital 54 African votes at the UN, if it ever came to a vote on who should get a permanent seat. South Africa seems to be stuck with changing the Ezulwini Consensus. No easy task, needless to say.